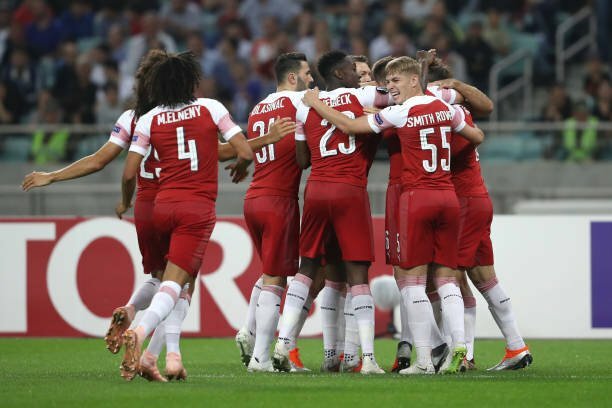 Arsenal will face off against Fulham at Craven Cottage on Sunday afternoon hoping to continue their eight-match winning run across all competitions. The Gunners have not dropped any points since their narrow defeat to Chelsea at Stamford Bridge back in August. The North London giants are currently playing some scintillating football and would be confident ahead of this weekend’s game versus the Cottagers. Unai Emery might opt for a 4-2-3-1 formation and make some changes to his first-team for this encounter in the Premier League. Petr Cech is out for this clash, and Bernd Leno should retain his place in the starting lineup. The centre-back pair of Shkodran Mustafi and Sokratis Papastathopoulos is expected to line up at the heart of the Gunners backline for this upcoming Premier League clash against the Cottagers. While Rob Holding has been good in defence, we expect him to get a rest for this weekend. Nacho Monreal is expected to take up his left-back responsibilities while Hector Bellerin would look to utilise his quickness on the other side of the Arsenal defence. Unai Emery’s men have kept back to back clean sheets versus Watford and Qarabag respectively so they should be reasonably confident about maintaining things solid at the back at Craven Cottage on Sunday. Arsenal could line up with the midfield duo of Lucas Torreira and Granit Xhaka who would both be responsible for protecting the backline while also dictating play at the centre of the pitch. The in-form trio of Pierre-Emerick Aubameyang, Mesut Ozil and Alex Iwobi might be unleashed ahead of them as part of the Gunners attack. Aaron Ramsey is likely to miss out again which could complicate matters further for the Welsh midfielder. Alexandre Lacazette will spearhead Emery’s attack up top on Sunday. He has scored two goals in his last three outings in all competitions so we can expect the Frenchman to strike again versus the Cottagers this weekend.